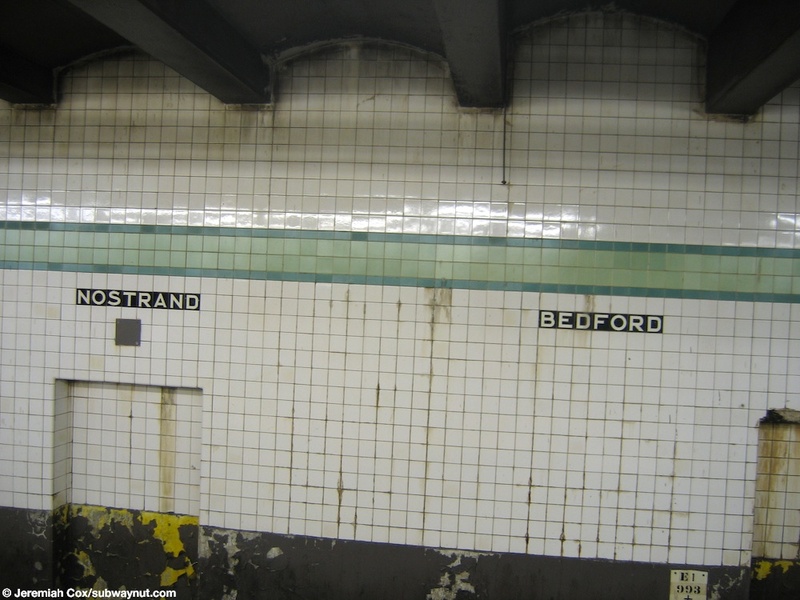 Bedford-Nostrand Avenue was supposed to a track connection station to the proposed IND Second System. North of the station there is a completely unused interlocking where two stub tracks enter the G's main tracks before crossing under the with them, having crossovers with them and then becoming a single terminating track that is the center track at Bedford-Nostrand Avenues and ends with switches to the other two tracks south of the station. The station itself has a three track, two island platform layout. Only the two outer tracks are used in revenue service although work equipment such as a garbage train has been scene stored in the center track. 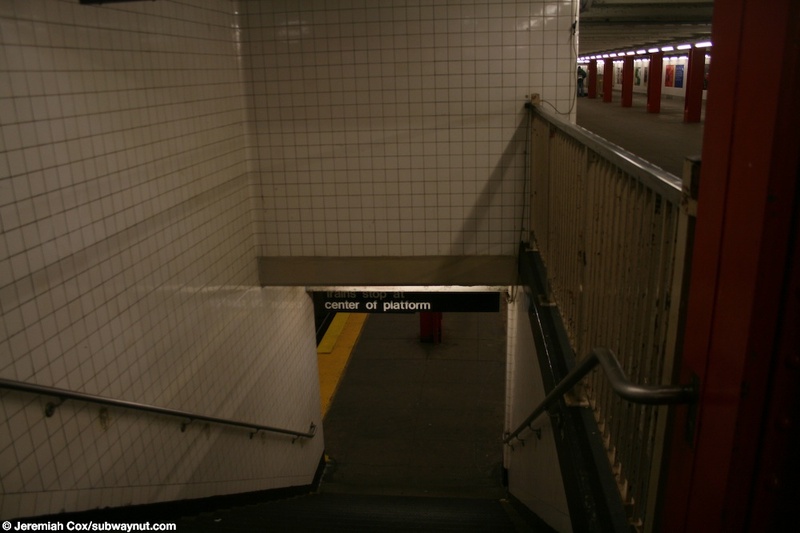 The station has a full-length entirely still open mezzanine with staircases between the mezzanine and the platforms at regular intervals. 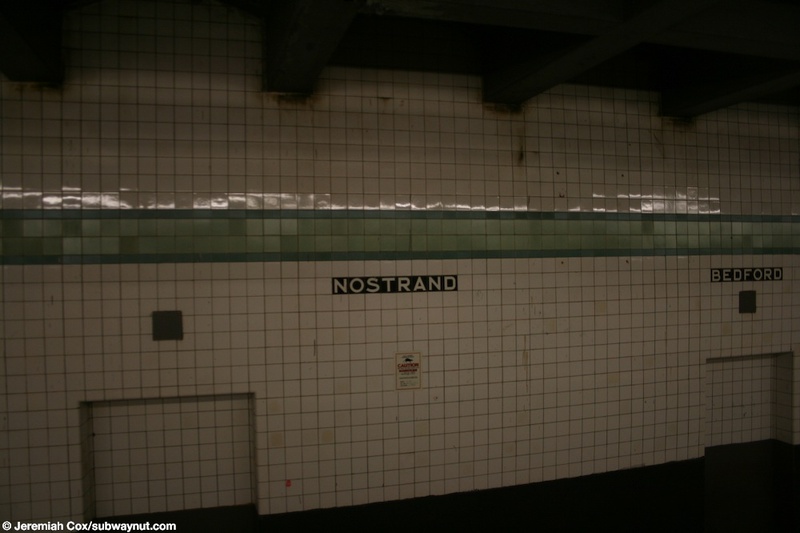 There is an exit at the very northern end of the platform (mezzanine) for Nostrand Avenue. This is where the token booth is and its fully staffed. 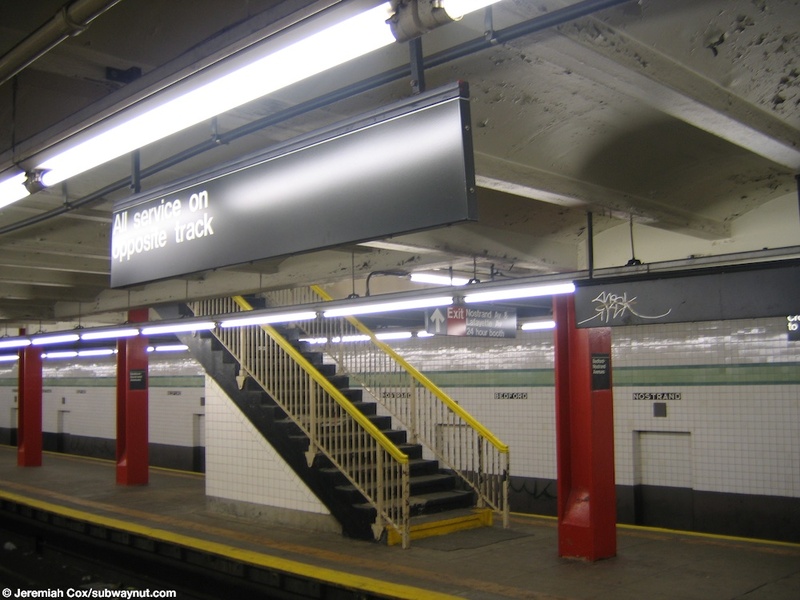 At the southern end of the platform (mezzanine) is the exit for Bedford Avenue; fare control is MetroCard High Entrance and Exit Gates. 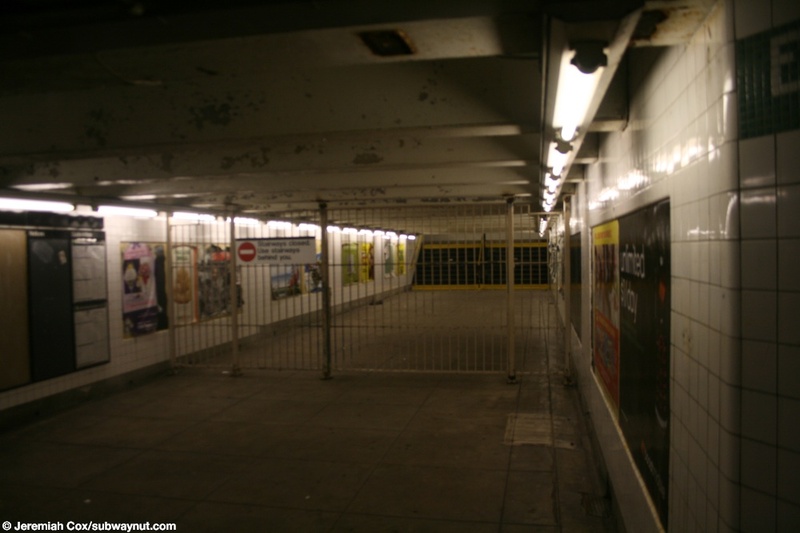 Currently only staircases to the Eastern Side of Bedford Avenue are open, the mezzanine used to continue with an underpass area outside of fare control to more exits on the western side of Bedford Avenue but it has been closed with a simple fence closing it off. 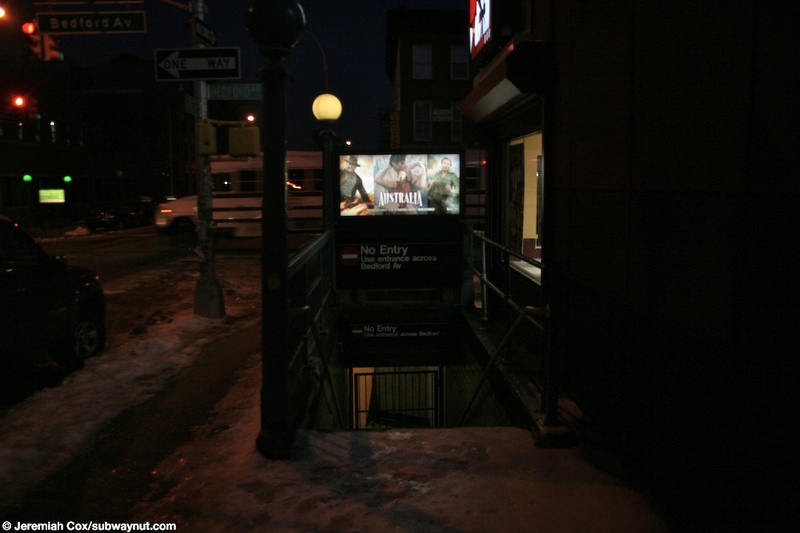 The staircases at street level are still in existence with Do Not Enter signs on them. 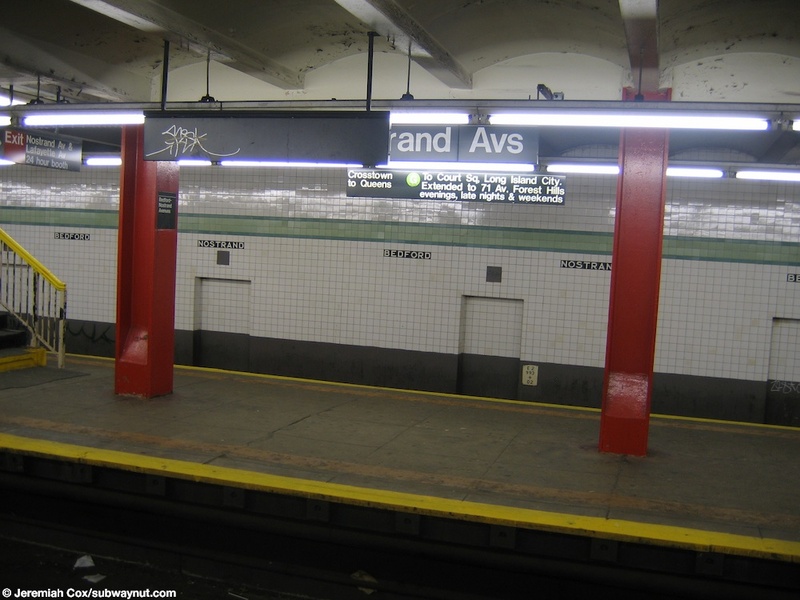 Since the station has two exits at the extreme ends of the platforms its a common place to see the G train Dash being ran. 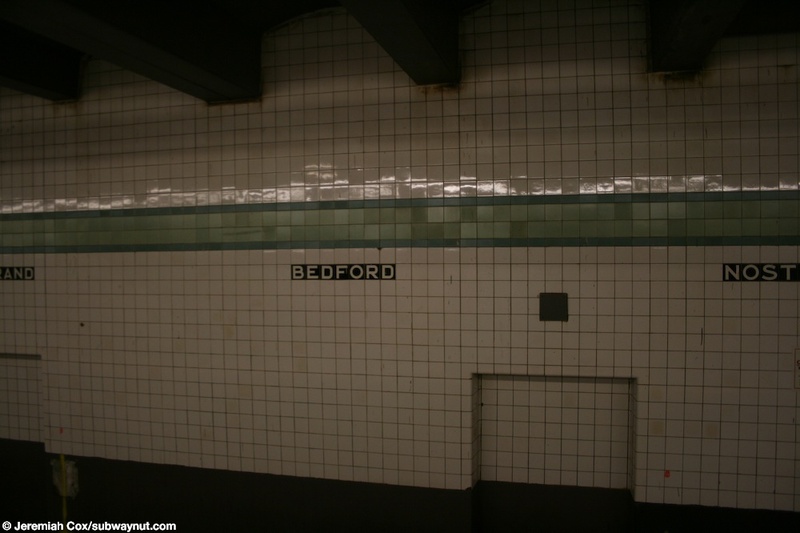 (bedford_nostrandg1) Looking out from a stopped G train at the three tracks, two island platforms Bedford-Nostrand Avs station. 5 October, 2003 (bedford_nostrandg2) The tiling along the tracks walls alternates between Bedford and Nostrand. 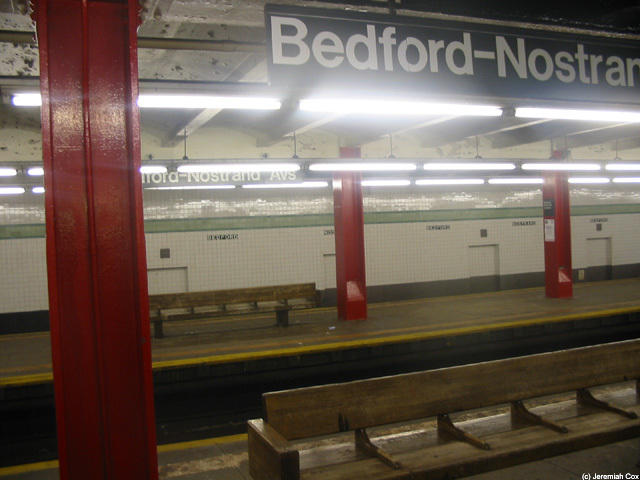 29 December, 2004 (bedford_nostrandg3) Looking across to a service sign on the Queens-bound platform at Bedford-Nostrand Avs. 29 December, 2004 (bedford_nostrandg4) An original 1930s style staircase up to the mezzanine from the narrow Queens-bound island platform at Bedford-Nostrand Avs. 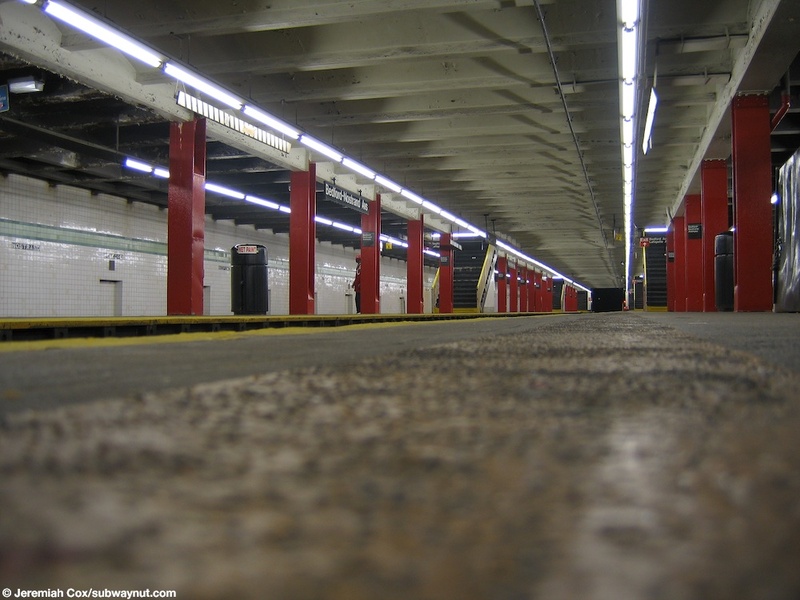 (bedford_nostrandg5) Looking down the tactile warning strip of the unused center track at Bedford Avenue. 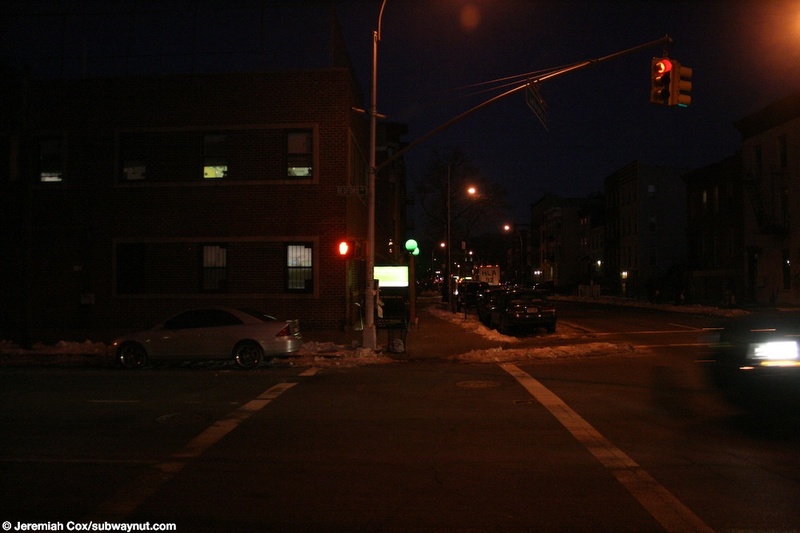 29 December, 2004 (bedford_nostrandg6) A closed entrance on the western (southern) side of Bedford Avenue, No entry signs are on it telling people to cross Bedford Avenue to reach the subway. For some reason a green globe is on the top of the entrance even though it is closed. 22 December, 2008 (bedford_nostrandg7) Another view at street level at the corner of Bedford Avenue and Lafayette Avenue. 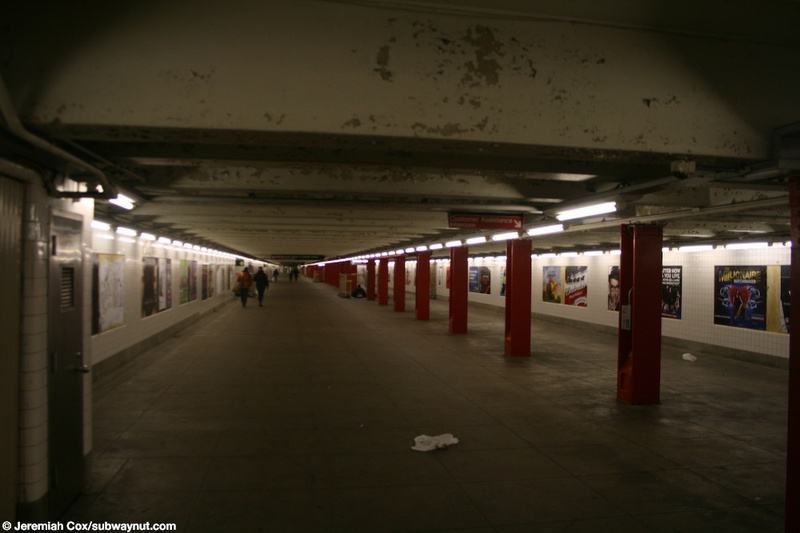 22 December, 2008 (bedford_nostrandg8) The view of the passageway that used to continue to the staircases on the eastern side of Bedford Avenue, beyond fare control. The fence looks fairly old although there are still lights on in it and adds on the walls. 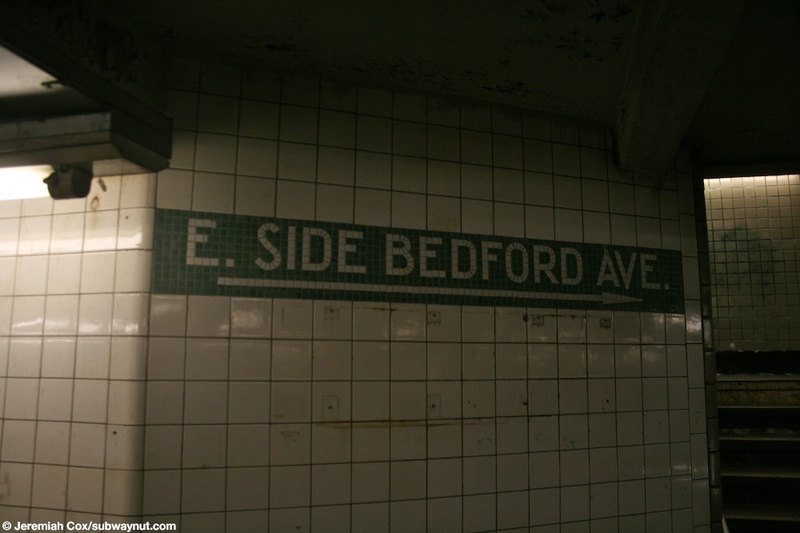 (bedford_nostrandg9) A mosaic for the east side of Bedford Avenue, it points towards a still open staircase. 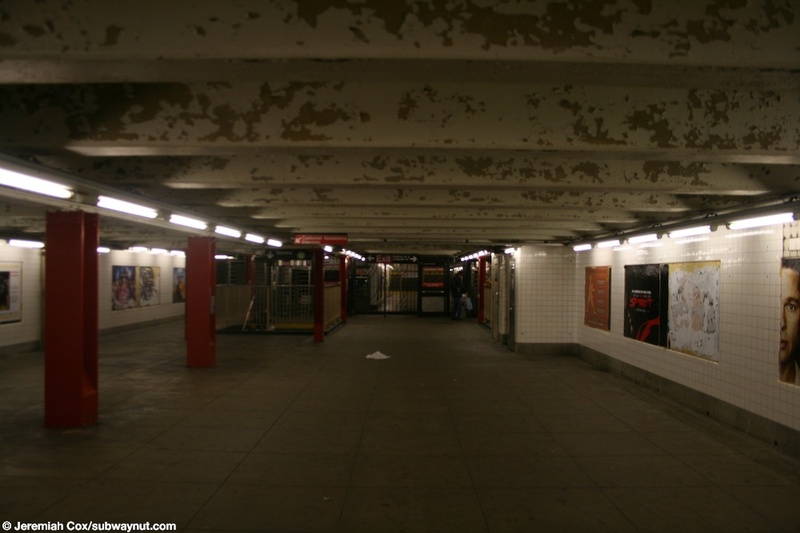 22 December, 2008 (bedford_nostrandg11) Looking down the long and decently wide mezzanine at Bedford-Nostrand Avenues that connects the two exits. It is slightly askew from being directly over both of the platforms. 22 December, 2008 (bedford_nostrandg12) Looking back towards the High Exit Gate exit to Bedford Avenue from the mezzanine. 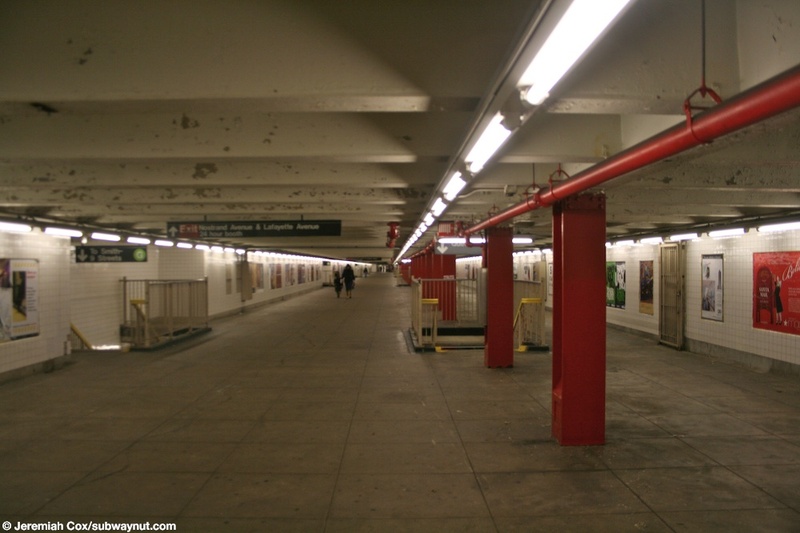 (bedford_nostrandg13) Another view down the endless mezzanine at Bedford-Nostrand Avenues that is longer than the platforms. 22 December, 2008 (bedford_nostrandg14) Bedford text in the platform walls at Bedford-Nostrand Avenues. 22 December, 2008 (bedford_nostrandg15) Nostrand beneath the green trim at Bedford-Nostrand Avenues. 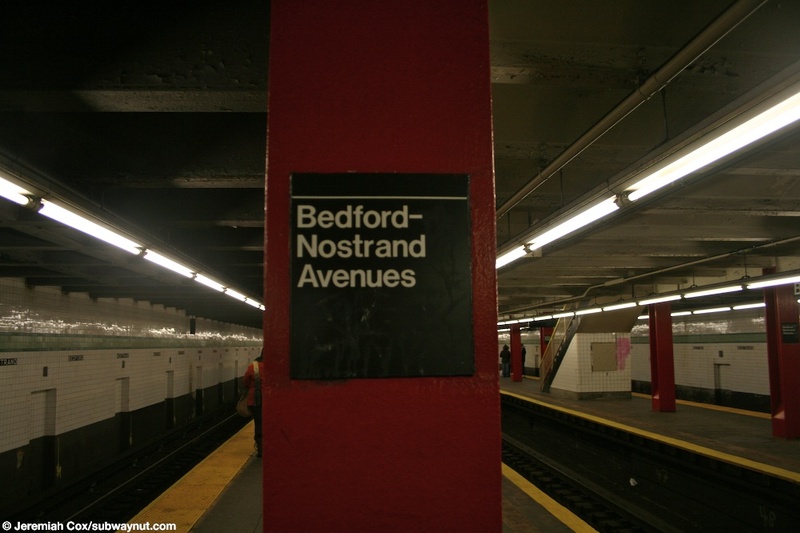 22 December, 2008 (bedford_nostrandg16) A column name sign at Bedford-Nostrand Avenues, the two narrow island platforms are also visible in this photo as well as the fact the in service wall tracks have gotten ADA tactile warning strips but the unused middle track hasn't.